I decided to challenge myself this fall by coming up with more savory pumpkin dishes. As a lover of all things pumpkin and pumpkin spice, I was excited to dive into this. 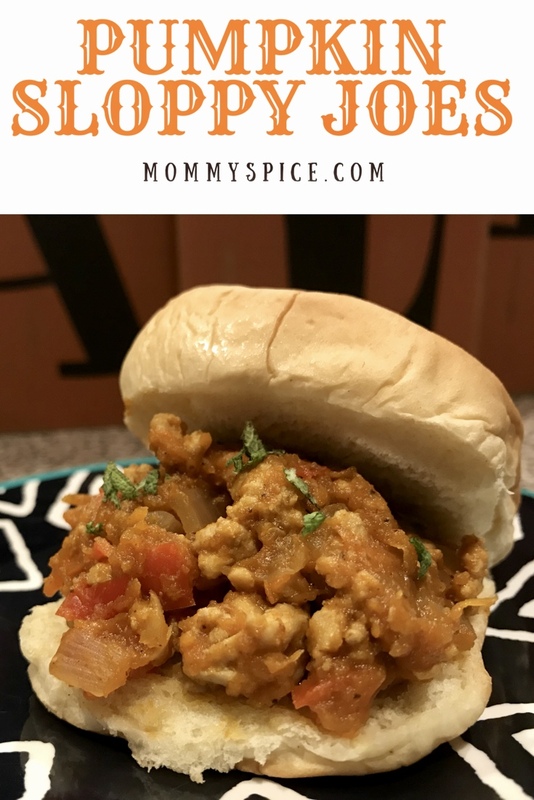 Sloppy joes were a favorite meal of mine as a child and I spent a lot of time finding that perfect recipe for my own sloppy joes. I was hesitant to mess with it, but boy was I pleasantly surprised at how these turned out. I kept my original recipe with a few modifications and this familiar well loved dish got an awesome fall makeover. In a large skillet on medium high heat add a drizzle of olive oil and sauté onion, pepper and carrot with a healthy sprinkle of salt, cook for 5 minutes. Add in ground turkey and cook through. In a bowl mix together garlic, ketchup, mustard, Worcestershire, vinegar, brown sugar, pumpkin, paprika and cloves. Pour sauce over meat mixture and stir until combined. Bring to a low boil, add in chicken broth and stir, then reduce heat to low and simmer 20 minutes. Serve hot on a bun or open face, topped with fresh sage. I was admittedly nervous when cooking this one. 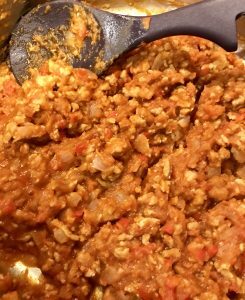 By using the ground turkey, which naturally has less flavor than beef it really allows the pumpkin and other flavors to shine. 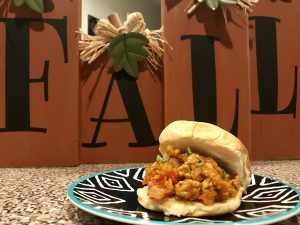 This is not a hidden veggie kind of dish, the pumpkin flavor will come through, my kids noticed a difference in flavor but were fine with it. 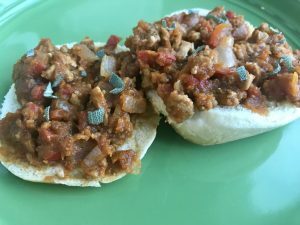 My tip for these is to use slider size buns, this dish is really all about the filling, so load up those smaller buns to get more filling and less bread. Also to keep this keto inclusive for my husband I served his sloppy joe mix in a bowl topped with a fried egg.